A very thought-provoking novel told from the point of view of a woman who is “different” from others in her daily life and therefore arouses uncomfortable feelings in others, leading to alienation and loneliness. Yet as we progress through the novel, learning more about Eleanor and her life, there are times when we cannot help agreeing with, and being amused by, her observations about those around her, as she misses social cues, communicates with people in a strange, over-formal manner, and shows a lack of knowledge of her own culture. While Eleanor makes progress in her life, suspense builds as we long to find out the truth of the traumatic events in her childhood which had such a devastating effect upon her. The novel has many moments of wisdom and discernment. I thoroughly recommend this novel for its psychological insight and its wry humour. Compassion, respect and kindness are human qualities common to all regardless of any faith position. In this post, I’m making a plea for these three things in the online world of books. Even when readers buy physical books in bricks-and-mortar bookstores they often like to post a review online. Recently I learned from my fellow authors of something very sad which is happening on Goodreads – which I had previously been totally unaware of. See this article by Anne Rice here. I have been aware that the dark side of human nature does indeed find outlets for expression on the internet but I had up to now been unconscious of the fact that this affects the world of reviewing books. In today’s publishing scene, Amazon reviews are of great importance to a writer – though I sometimes wish they weren’t. The fact remains a new review can lift an author’s spirits, and a lack of reviews can (however mistakenly) feel like rejection. But it came as a great surprise to me to learn that some people are using their membership of book review sites as an opportunity to express spite, envy and malevolence to others. I love writing books, reading books and reviewing books. Every book review I post online is authentic. It has never occurred to me to ever post a spurious review or a one star rating simply to hurt someone else. I never post one star reviews. If a book genuinely warrants such a rating, I would be most unlikely to even read it all the way through, and I would simply choose not to post a review at all. I generally give 4 or 5 star reviews and sometimes 3 star. Perhaps I’m over-generous with my star-ratings. Or perhaps it’s down to the fact that I have an instinct to choose books I know I’ll enjoy reading. I write reviews because I enjoy it; never to criticise, condemn or discourage. for love of creating characters, allowing our imaginations free rein with our created world writing dialogues, entering new worlds. So I hope that book reviewers would also write for love. “Love”, by the way, means respect for others, authenticity and honesty: and it includes constructive criticism. It also means reading a book all the way through before writing your opinion of it on a permanent online platform like Goodreads or Amazon. If you’re an author to whom online reviews are important, I’d love to have your comments on this subject. Thank you very much to Judy, the owner of Kenilworth Books, for the success of my author event on Saturday 13 February 2016 in her bookshop in Talisman Square, Kenilworth. Not only did Judy do a tremendous amount to publicise the event on social media but she created a wonderful eye-catching display in the shop, and placed my book prominently on the bookshelves. I was pleased to see many familiar faces in the shop that day, as well as several new faces, and I hope the healthy sales will result in some happy readers… and maybe even some more Amazon reviews! 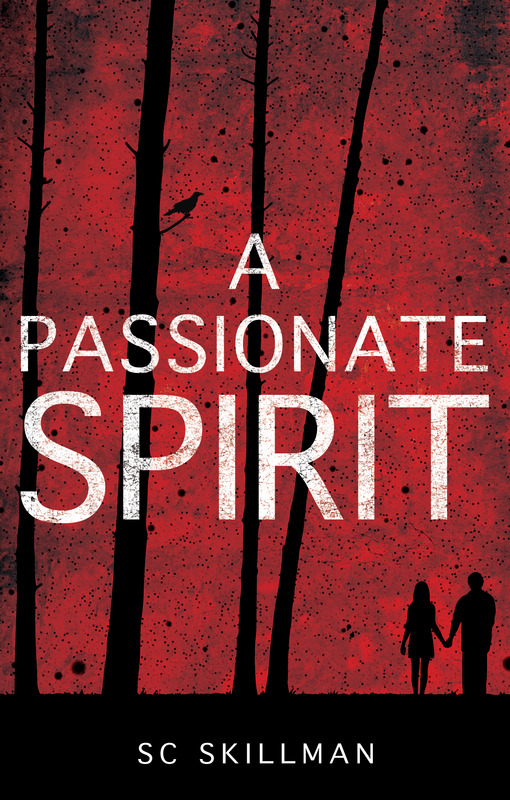 Only four days now until publication day for “A Passionate Spirit“. Instead of a bookshop party I shall be “launching” this novel with visits to three local Christmas fairs in Warwickshire this year, and then starting in February, I plan to do a series of signings, one in Kenilworth Books, one in Waterstone’s Leamington Spa, and a possible “ghostly” book event with other local authors organised by Warwick Books in the atmospheric Great Hall in Lord Leycester Hospital in Warwick. My first event will be the Christmas Fair at Princethorpe College, Rugby, on the day after publication day – Sunday 29th November 2015, from 2.00-4.30pm. If any of you are local to that area, and have some free time then, do drop in to the fair where I’m sure there will be many wonderful Christmas gift ideas. I’ll have signed copies of the new novel for sale, alongside copies of my debut novel “Mystical Circles. I’d be delighted to see you there! Meanwhile in the next few days Matador will send me their mailing list for me to check, listing all those who’ll receive my Press Release, and I hope that there will soon be some exciting media coverage to report here, on my website and on my Matador page. The ebook will also be available for purchase from all online stores from 28th November, and for six weeks it will be possible to download a copy free from Net Galley for review. And then… back to the next novel. Several chapters have already been written, and in the last few days I’ve been noting down some fresh inspiration! Publication date draws ever closer – 28th November! My new novel “A Passionate Spirit” has now been sent to print and will be ready in the next couple of weeks. Meanwhile Matador’s ebook department are converting the manuscript to an ebook. When the ebook has been uploaded to online retailers, it will also be on Net Galley for 6 weeks. There, keen readers and reviewers can download the new releases free of charge for review. If you do a lot of fiction reading, and enjoy writing online reviews, and you’re not already a member of Net Galley I’ll be including a Net Galley widget in a blog post closer to publication date, and you can then sign up! Or of course you can head on over to Net Galley now and join straight away. Remember, word-of-mouth recommendation is critical to an author’s success, and online, that means reviews, and plenty of them! You’ll be able to post a review on my webpage at Matador as well as on Amazon, Goodreads and my Facebook Page. Meanwhile I’ve booked a stall at three Christmas fairs in Warwickshire, to sell copies both of my first novel “Mystical Circles” and my newly released book “A Passionate Spirit.” I always enjoy doing local fairs and events; it’s fun to chat to the visitors and to find out what sort of books they like reading, and when they do their reading. I’ve learned some interesting information about different reading habits that way! In addition, I’ll be doing some book signing events at local bookshops. More about those closer to the time! 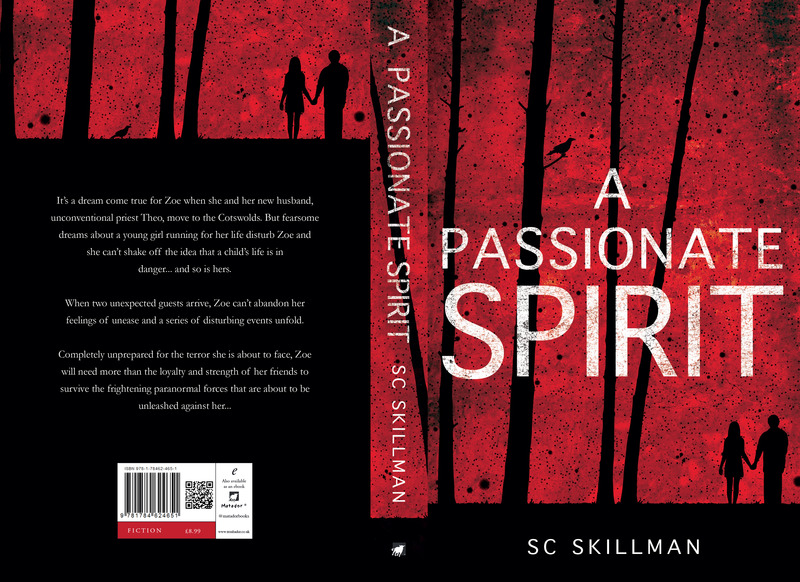 I’ve just heard from Matador that my front cover for my new novel A Passionate Spirit is now approved, and I’ve just seen the final drafts of my marketing material for the novel. My “Advance Information” sheet will shortly be mailed out to retailers, library suppliers and local bookshops. My Press Release marketing will begin once copies of the printed book are available, when the marketing controller at Matador will contact me with the PR list that they’ll draw up for my book. All very exciting! In addition I’ve just received back a report on my copy-edited ms from one of my 4 beta readers, with some useful insights and observations which will help me tweak the novel and sharpen it up, even now, at the last moment before it goes for typesetting! 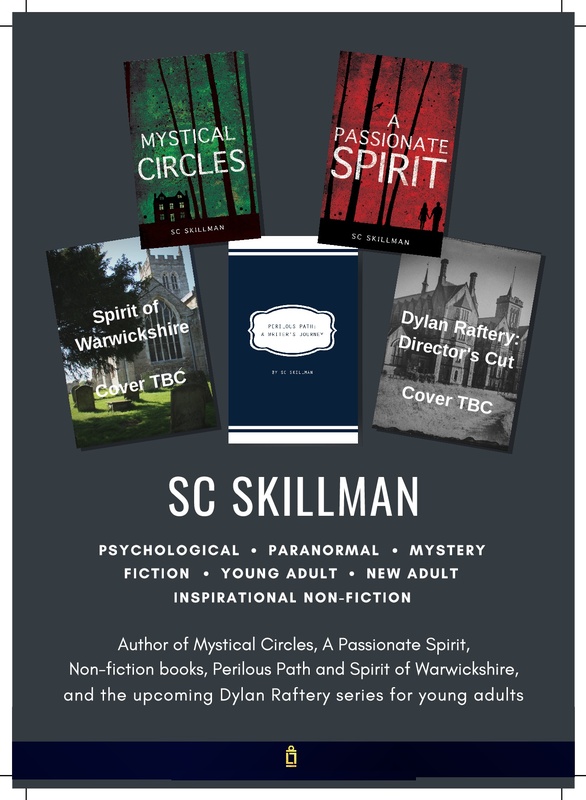 I’ll soon have some promotional A Passionate Spirit Bookmarks ready too which I’m looking forward to being able to hand out to any of my target readers – those who love reading paranormal thrillers! For all those who’ve wondered how one starts to get noticed as an artist in London, and is in the mood for a light-hearted approach to the subject I can recommend a book which might have escaped my notice if I hadn’t recently met the author at a conference. 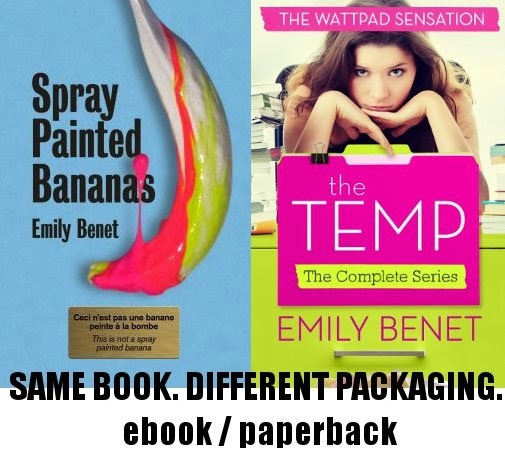 Emily Benet first posted her book chapter by chapter on Wattpad and had such a good response from readers that she came to the attention of Harper Impulse, who published the book as “The Temp”. I bought the book after listening to Emily talking about social media for authors at the recent conference at the University of Leicester. Emily certainly incorporates her knowledge of social media into this novel. I learned from her that the book was originally called “Spray Painted Bananas”, and I believe that was a much more original title. Purely from the cover design and title that Harper Impulse have given this novel I would have identified it as generic chick-lit and probably not have picked it out in a book shop. And yet, reading the novel, I find it much more than chick-lit. It gives a delightful and witty insight into the London art world, and I found myself thinking of the main protagonist, Amber, as a budding Tracy Emin. It’s so easy to look at installations in the Tate Modern and think, Oh I could do that. But the reality of getting yourself known as an artist is far more complex and challenging. Emily Benet has great fun, not only with the motivations and behaviour of those who visit art galleries for private views, but also with the ways in which an artist may start to become known, particularly in London. I loved this story, found the characters engaging and entertaining, especially Amber’s flatmate Egg, and enjoyed the rom com element as well. Highly recommended for a fun read.